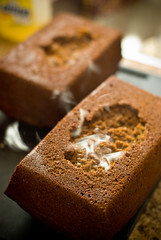 steaming hot gingerbread pumpkin loafs.. soo good. I am not especially fond of traditional Christmas food, as a vegetarian the traditional Christmas diner is out, I am more likely to eat a vegetable curry than anything else at Christmas. I do not like Christmas cake, or Christmas pudding but love Gingerbread and of course the eponymous name of this blog indicates that I love pumpkin. This gingerbread recipe is rich and for me a perfect accompaniment to morning coffee. I love them for Christmas morning with breakfast I cut thick slices and dip them in eggs mixed with more ground ginger and then fry them in butter. Grease two large loaf tins. In a large mixing bowl, combine sugar, oil and eggs. Beat until smooth. Add the milk, treacle and vanilla and beat until well mixed. Fold in the pumpkin and spices. In a medium bowl, combine flour, baking soda, baking powder and salt. Add dry ingredients to pumpkin mixture and blend just until all ingredients are incorporated. Divide batter between prepared pans. Bake for about an hour or until toothpick inserted in centre comes out clean.